Far more than a superb memoir about the highest levels of professional tennis, Open is the engrossing story of a remarkable life. Andre Agassi had his life mapped out for him before he left the crib. Groomed to be a tennis champion by his moody and demanding father, by the age of twenty-two Agassi had won the first of his eight grand slams and achieved wealth, celebrity, and the game's highest honors. But as he reveals in this searching autobiography, off the court he was often unhappy and confused, unfulfilled by his great achievements in a sport he had come to resent. Agassi writes candidly about his early success and his uncomfortable relationship with fame, his marriage to Brooke Shields, his growing interest in philanthropy, and--described in haunting, point-by-point detail--the highs and lows of his celebrated career. 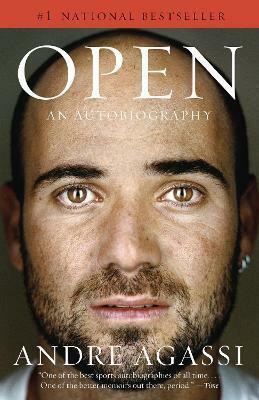 "Agassi may have just penned one of the best sports autobiographies of all time. Check-it's one of the better memoirs out there, period. . . . An unvarnished, at times inspiring story [told] in an arresting, muscular style. . . . Agassi's memoir is just as entrancing as his tennis game." "Fascinating. . . . Inspiring. . . . Open describes Agassi's personal odyssey with brio and unvarnished candor. . . . [Agassi's] career-comeback tale is inspiring but even more so is another Open storyline. It could be called: The punk grows up. . . . Countless athletes start charitable foundations, but frequently the organizations are just tax shelters or PR stunts. For Agassi helping others has instead become his life's calling. . . . Open is a superb memoir, but it hardly closes the books on an extraordinary life." "Honest in a way that such books seldom are. . . . An uncommonly well-written sports memoir. . . . Bracingly devoid of triumphalist homily, Agassi's is one of the most passionately anti-sports books ever written by a superstar athlete." "Not your typical jock-autobio fare. This literate and absorbing book is, as the title baldly states, Agassi's confessional, a wrenching chronicle of his lifelong search for identity and serenity, on and off the court." "The writing here is exceptional. It is can't-put-down good." "An honest, substantive, insightful autobiography. . . . The bulk of this extraordinary book vividly recounts a lost childhood, a Dickensian adolescence, and a chaotic struggle in adulthood to establish an identity. . . . While not without excitement, Agassi's comeback to No. 1 is less uplifting than his sheer survival, his emotional resilience, and his good humor in the face of the luckless cards he was often dealt." "The most revealing, literate, and toes-stompingly honest sports autobiography in history"
"Much more than a drug confession-Agassi weaves a fascinating tale of professional tennis and personal adversity. . . . His tale shows that success is measured both on and off the court." "Not only has Agassi bared his soul like few professional athletes ever have, he's done it with a flair and force that most professional writers can't even pull off." "[A] heartfelt memoir . . . Agassi's style is open, all right, and his book, like so many of his tennis games, is a clear winner." "Hard-won self-knowledge irradiates almost every page of Open. . . . Not just a first-rate sports memoir but a genuine bildungsroman, darkly funny yet also anguished and soulful. It confirms what Agassi's admirers sensed from the outset, that this showboat . . . was not clamoring for attention but rather conducting a struggle to wrest some semblance of selfhood from the sport that threatened to devour him." "A riveting and reflective memoir by a man who rose to the top of his sport-despite hating it." "Celebrity tell-alls have rarely been this honest and this interesting." "A vivid portrait of the internal battle faced in some measure by every athlete." "Articulate. . . . Expertly rendered." "Refreshingly candid. . . . This lively, revealing, and entertaining book is certain to roil the tennis world and make a big splash beyond." A New York Times Notable Book and a Forbes, San Francisco Chronicle, and Washington Post Best Book of the Year "Agassi may have just penned one of the best sports autobiographies of all time. Check--it's one of the better memoirs out there, period. . . . An unvarnished, at times inspiring story [told] in an arresting, muscular style. . . . Agassi's memoir is just as entrancing as his tennis game." --Time "Fascinating. . . . Inspiring. . . . Open describes Agassi's personal odyssey with brio and unvarnished candor. . . . [Agassi's] career-comeback tale is inspiring but even more so is another Open storyline. It could be called: The punk grows up. . . . Countless athletes start charitable foundations, but frequently the organizations are just tax shelters or PR stunts. For Agassi helping others has instead become his life's calling. . . . Open is a superb memoir, but it hardly closes the books on an extraordinary life." --The Wall Street Journal "Honest in a way that such books seldom are. . . . An uncommonly well-written sports memoir. . . . Bracingly devoid of triumphalist homily, Agassi's is one of the most passionately anti-sports books ever written by a superstar athlete." --The New York Times "Not your typical jock-autobio fare. This literate and absorbing book is, as the title baldly states, Agassi's confessional, a wrenching chronicle of his lifelong search for identity and serenity, on and off the court." --Los Angeles Times "The writing here is exceptional. It is can't-put-down good." --Sports Illustrated "An honest, substantive, insightful autobiography. . . . The bulk of this extraordinary book vividly recounts a lost childhood, a Dickensian adolescence, and a chaotic struggle in adulthood to establish an identity. . . . While not without excitement, Agassi's comeback to No. 1 is less uplifting than his sheer survival, his emotional resilience, and his good humor in the face of the luckless cards he was often dealt." --The Washington Post "The most revealing, literate, and toes-stompingly honest sports autobiography in history"
--Rick Reilly, ESPN "Much more than a drug confession--Agassi weaves a fascinating tale of professional tennis and personal adversity. . . . His tale shows that success is measured both on and off the court." --New York Post "Not only has Agassi bared his soul like few professional athletes ever have, he's done it with a flair and force that most professional writers can't even pull off." --Entertainment Weekly "[A] heartfelt memoir . . . Agassi's style is open, all right, and his book, like so many of his tennis games, is a clear winner." --O, The Oprah Magazine "Hard-won self-knowledge irradiates almost every page of Open. . . . Not just a first-rate sports memoir but a genuine bildungsroman, darkly funny yet also anguished and soulful. It confirms what Agassi's admirers sensed from the outset, that this showboat . . . was not clamoring for attention but rather conducting a struggle to wrest some semblance of selfhood from the sport that threatened to devour him." --The New York Times Book Review "A riveting and reflective memoir by a man who rose to the top of his sport--despite hating it." --San Francisco Chronicle "Celebrity tell-alls have rarely been this honest and this interesting." --Baltimore Sun "A vivid portrait of the internal battle faced in some measure by every athlete." --Bloomberg News "Articulate. . . . Expertly rendered." --The Morning News (Boston) "Refreshingly candid. . . . This lively, revealing, and entertaining book is certain to roil the tennis world and make a big splash beyond."